I don’t think I’m alone in collecting re-usable grocery bags and book bags. So eco, so wonderfully varied, so easy to use. And I’m always on the lookout whenever I’m abroad. So I had to sign up for Carin aka A Little Bookish‘s The Great Grocery Bag Exchange, right? 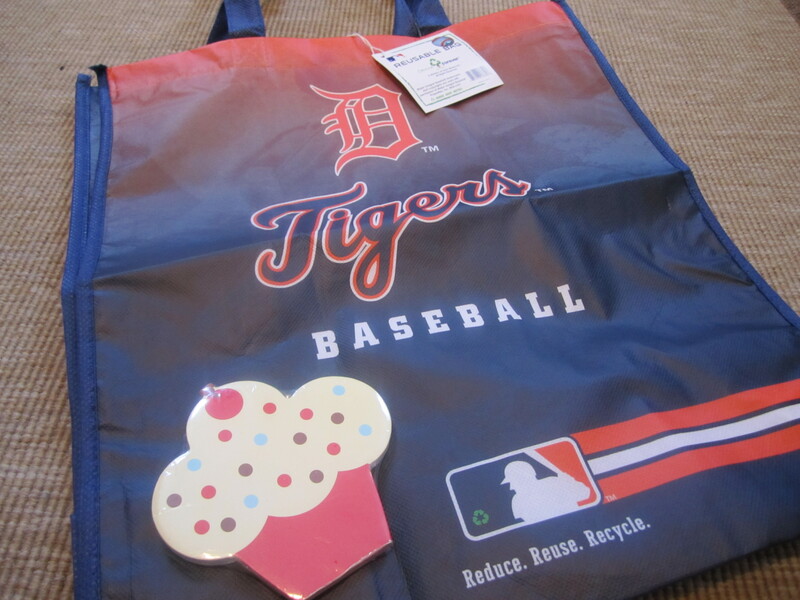 The bag is from Kristina’s local baseball team. Isn’t it gorgeous and retro? I’m a big fan of baseball and used to watch it on tv with my grandfather in Japan. Shame they don’t play it in the UK! And navy and orange is my favourite colour combo ever. Always a win. And she’s also included an extremely cute cupcake notepad. Thank you Kristina! Check out everyone else’s loot here. So, what’s your favourite eco bag? Great idea! I have one for each bag – my current fave is one from my friend Steffi – it’s got thick handles (comfy) and a beautiful pattern a bit like kimono – you know the thin obi with kind of square/circles printed on it? Hard to explain, hehe. Very cool bag! Enjoy it! Oh I like it! I like the little notepad too (I’m a huge fan of little notepads)! It’s kind of a shame that baseball isn’t popular in the UK/Europe. It’s a fun game to watch even if it’s a little slow. Thanks so much for participating in the event! I’ll organize another one at some point in the future! That is a really nice bag and quite unique to be the owner of such a bag in Europe, I think. The notepad is so sweet! I need a new one, will look out for something like that. Wasn’t it fun, the bag exchange? I wonder if you sent Kristina a Bag for Life (Tesco)! Do they still have them? They used to be so nice, different patterns every few weeks/months. Sasa: I think I know what you mean:) That’s a good idea to keep one in each of your bags. May have to do that myself! Carin B: Thanks for hosting Carin! Great bag! I alos love retro style things. And what a cute notepad. Sorry, that was supposed to be “also” not “alos”. This Great Grocery Bag eXchage is fun, isn’t it?! I hope we all get to do it again next year!